Leslie Basham: Barbara Rainey says Jesus wants your home to be an extension of God’s kingdom. Barbara Rainey: Is your house about yourself? Is your house about your own agenda? Your own comfort? Or is your house a representative of the King of heaven? Leslie: This is Revive Our Hearts with Nancy DeMoss Wolgemuth, author of Lies Women Believe, for September 14, 2018. Yesterday, Barbara Rainey explained our calling as ambassadors for Christ and how we live and engage with our community. Nancy and Barbara are back today to finish that conversation and talk about how to make your home an embassy for the King of heaven. Nancy DeMoss Wolgemuth: Well, I’m sitting in the studio with my long-time friend Barbara Rainey. Barbara and Dennis Rainey are the co-founders of FamilyLife. Revive Our Hearts and FamilyLife have been connected going back a long, long ways. So thank you, Barbara, for being a friend to me and to our ministry and to all the women everywhere who benefit from your writing and teaching. I’m so grateful for that. Barbara: Well, thank you, Nancy. It’s a delight to be here. Nancy: I’m sitting looking at a plaque that you and your husband brought to my husband and me some time ago. It says, “Welcome to the embassy of the King.” It’s a gift you gave us that’s in our home. It’s a plaque that I would like for all of our listeners to have in their home because I think this concept of our homes being an embassy of the King—Christ Jesus—and us being His ambassadors, is a really important and powerful concept in our world today for us to think this way. So that’s why we’re taking a couple of days to talk about this. You first got the idea when you watched a video about an eighty-two-year-old widow in an Eastern European country who sparked your imagination on this subject. Barbara: I did. I got to watch this little video. This sweet, dear, older woman, whom I would love to meet, by the way. I would love to go to her house someday because she showed the viewers in the video how she has made her home an embassy. And when I saw that, I thought, She’s right. Our homes are embassies for the King. Nancy: Now, when you think of an embassy, you think of a great big, huge, ornate house. Nancy: But this home she was in was not anything like that. Barbara: No. In fact, I think, if I remember right, she lived on the upstairs floor of kind of a flat or a little apartment or something. It was very small. It was very plain. She had some pictures on the wall of her family. There was a cross on a wall. But I just sensed watching the video that this was a very warm, very welcoming space. And I remember thinking after I watched it, I want to go visit her. I want to go have tea with this dear woman, because I sensed that she was a great representative of Jesus in her community. Nancy: I can’t imagine today that there could be any more effective means of sharing our faith of evangelism than something like this, where the homes of Christians are known to be a place where you can go for comfort, encouragement, help, refuge—a refuge for your heart. And then our friend Holly spent the day trying to help this young man find a place where he could go and he could be cared for. Her home is an embassy of the King. Nancy: People know that is a safe place. Barbara: And you’re exactly right. All of us who name the name of Christ, our homes should be known for that. Our homes should be welcoming. They should be open. They should be easy access for people who need something. I love that story about Holly that her son knew that he could bring this homeless young man home with him, and that it would be okay. I wonder about how many other homes would that be true? Would your teenage son feel comfortable bringing someone home? Or would he be condemned and ridiculed for bringing someone home? Is your house about yourself? Is your house about your own agenda? Your own comfort? Or is your house a representative of the King of heaven? That’s what this video inspired me to do, and that’s why we created this plaque because I think, like you, that Christian homes need to be outposts. They need to be embassies, representing Jesus Christ. Because the God of the universe is sovereign, He’s put all of us in very specific places for very specific reasons. And part of that purpose is to be a light, to be a witness, to be an example to those in our neighborhood and those that He brings across our path. So He wants us to be ambassadors. He’s called us to be ambassadors. I think it’s good for us to think of our homes as an embassy. It helps me not feel like it’s mine. It reminds me that my home really is His, it’s not mine. So, therefore, I need to use it for His purposes and not my own. Nancy: And our natural inclination, unless you’re a really outgoing person who just loves talking with all the neighbors, but more naturally I think we’re prone to close our doors, drive into our garages, close the garage door, and we never see our neighbors or other people. Our homes become a place just to showcase our stuff or just a parking space where we park our bodies and our stuff in-between running out and around everywhere else in the world. It can be just a stopping-off place, or we just cross in the night, and we don’t really have meaningful conversations, meals, relationships. I think growing up of so many meals, gathered around our family table with other people. Sometimes it was Christian workers, sometimes people who didn’t know Jesus, sometimes a marriage that was falling apart, and these people were welcomed to our table. Now, it means extra work. It means extra time. It means extra effort. It means sometimes your stuff is going to get wrecked. I remember when I built my first home. I was traveling on the road in itinerant ministry for years. So I didn’t own a home until I was in my 30s, and when I did, I just made a conscious decision as I got new furniture (I didn’t own anything until I had this first home). I got white sofas. What possessed me to do that, I don’t know! (laugh) But I remember thinking, This home and this furniture is not first and foremost about me. This is going to be a place where people can come. In fact, I hadn’t been there a week before a friend came over, holding a child, who, as it turned out was sick, and the child was spilling some red medicine on that new, white sofa. I lived that way for years as a single woman, trying to have a home where people could experience Jesus and His love. And now Robert and I have it as our goal for our home to be a place where people can be loved and embraced and can be prayed with. We’ve had so many prayer times with people in our home—contractors, people stopping by to run an errand, the guy who delivers—Robert’s out front praying with the UPS man—somebody who comes to deliver something. This is a sweet way to live, but it’s also a sweet way to make Jesus known to those around us. Barbara: Well, you’ve done a phenomenal job of that because we’ve watched you do that for years, the way you’ve brought people into your home and into your life. I think you’ve been a great role model. I think what you’ve experienced is you’ve experienced connections with God that you wouldn’t have otherwise. Barbara: I think when we release our homes, when we release our ownership, so to speak, of those things that God has entrusted to us, and we step out in faith and say, “God, how do You want to use me?” then we’re opening the door to experience God in ways that we wouldn’t have otherwise. Barbara: I just picture Robert standing out there praying with someone. What a sweet experience. What an amazing opportunity to be a part of what God is doing in that person’s life. I think when we seal ourselves off, we withdraw, we close the door, and we kind of become hermits; we’re cutting ourselves off from the experiences that God wants to give us as His ambassador to connect with other people. He will strengthen us. He will provide the food and whatever else is needed. We need to not fret the details. He’ll provide those things. What we need to do is make ourselves available to be used by Him in other people’s lives, and we’ll get to experience the thrill of being a part of God working miracles. Nancy: Yes. And I want to be quick to say that, for Robert and me, this does not come naturally. We’re both more introverted, and we would be happy, we think (at least in the temporal sense) . . . It’s more our inclination to sit and seal ourselves off. I say sometimes I’d love ministering in the uninhabited regions of the world because naturally I am more reserved. You don’t think of a teacher/speaker that way, but I am. We love our quiet time. We love our privacy. And it inconveniences you to have people drop in or to have lots of little kids there. We’re kind of past the little-kid season of life at our age, but we’re trying to have the heart of Jesus that welcomes children and sinners and old people and families and people who need a place to stay and missionaries. That doesn’t mean we do that every day or that we never have time for just us, but we’re trying to live lives that are open-hearted, open-handed, and sometimes that means opening your door just to let people feel at home there. Barbara: Yes. I agree. I have to say, too, that I’m like that as well. I’m much more of an introvert. Dennis and I, in this season of our lives, we’ve been so busy that we really do love coming home to the sanctuary of our house. And in that sense, our house as an embassy really is for our own feeding and restoration of our souls. But, like you said, it’s having that attitude that, “My house and my life belong to Someone else.” This house is not my home. My home is in heaven, and someday I will be at perfect rest, in perfect peace, and I will have all that I need in heaven. That day is coming, but until that day comes, we are living to be available to Him and to live lives that He can use with people that we might not be anticipating, but it’s a part of His plan for us. So I think when Dennis and I think of our lives as not belonging to ourselves, our home is not just for us—it is for us, but it’s not just for us. I think, like you, that having that open-handed mentality makes a big difference. Nancy: Yes. And it may be the place that you come back to, to get refueled, to get replenished, so that you can go back out and serve and bless others around you. Nancy: But the point is your lives are an offering, and everything you have is an offering to the Lord. Nancy: And that’s the way we’re all supposed to be living. Barbara: Exactly. And that’s the whole idea, actually, of an embassy. I have a young friend who, along with her husband and four children, spent about five years living in the country of Uganda, and Uganda is a very poor country. They lived near the capital city, and it was very busy. They lived in sort of a compound of other missionaries to that area. So they had a lot of varied experiences. I loved hearing from her because her experiences were so different from what we have in America. One day she told me the story about how a friend of hers, who was also a missionary and also there with her family in Uganda, her son had just learned to drive. They needed him to drive the one car that they had as a family for some special reason (and I can’t remember what that was). But he got in the car, and he started driving. As he was driving in the city streets as a sixteen-year-old, maybe he was seventeen, there was a convoy that went by. The horns were honking, and he was a little startled, a little caught off guard. He was a young driver, and he didn’t move over to the side of the road quickly enough. Well, in that country, that was a high offense, and immediately a policeman pulled him over, jerked him out of the car, and accused him of being a spy. And they took this boy to jail, and they put him in jail. His parents, of course—that was the only family car that they had—but they managed to get there. They were trying to talk to the officials, and they couldn’t make the officials understand that he had done nothing wrong, that he was just a young boy, that he had just learned to drive, and that he was sorry. He didn’t mean to be in the way of the convoy. As my friend told me the story, it was almost miraculous because the power that the Ambassador in that country had, because he represented the United States. This family were American citizens. They were living in another country, but they were American citizens. And the American Embassy was there to help the American citizens. It’s such a wonderful picture, not only for them, but for all of us to understand that that’s what embassies are supposed to provide. They’re supposed to provide help and safety and protection when people are in need. So if I’m an ambassador of Jesus Christ, and my home is His embassy, He wants me to be available to help people who are also in need, who also need someone to rescue them or a listening ear. I think as families, as moms and dads, as you talk to your kids, as you can help them understand the concept of what an ambassador is, what an ambassador does, and how we as Christians have been called to be an ambassador, that our house is Christ’s embassy, it helps us understand what God has called us to do on earth. It’s why He’s left us here and some of the purposes He might have for us in our neighborhoods and in our communities. Nancy: As we live that way, as we think of our lives and our homes as being embassies of the King, and we are His ambassadors, we’re really giving people a glimpse of that eternal home that is ours and that can be theirs. Nancy: So we’re saying, “Come into my world, into my home, and let me let you rest and be safe and be loved and welcomed and embraced,” as a picture of what you can have through Christ who welcomes us to His eternal home. Nancy: It’s a means of sharing the gospel, the good news of the home that we can have in Christ. Barbara: That’s right. I think that’s what God has pictured for us. He wants us to be His representative. He wants us to be His ambassador and bring many, as it says in Scripture, into a relationship with Him. We are, as you said earlier, the fragrance of Christ, and as we represent Him, hopefully others will see the Holy Spirit in us. They’ll see the life of Christ in our lives, and they will want to know more. Nancy: This is why I think the New Testament places such emphasis, as does the Old, now that I think about it, on the ministry of hospitality. Nancy: Opening our homes, opening our hearts—not to show off our stuff, not to do amazing meals. Nancy: We want to create a hunger, a thirst in people to know our King. That’s who we’re representing. Just last night I had a conversation with my daughter. She’s a mom of seven boys, and her oldest ones are on the football team now. She was telling me that last night they had the football team over for dinner—not all of them, but about half. Barbara: And I said, “Oh, you have got to send me pictures.” And she sent pictures and told me the story of how many hot dogs and baked potatoes and all this stuff they fed this army of boys. But I just pictured, when I saw the photographs she sent from her phone, These boys are getting a taste of what it’s like to be in a Christian’s home, because my daughter loves people, and she loves serving. She’s got a million things to do with her house full of seven kids, but she also understands that God has called her to be an ambassador, and this was just a real easy way, relatively easy, anyway, for her. And the ease that she has of relating to these kids, these friends of her sons, is a representative of what Jesus is like. I’m sure some of those boys thought, I like this home. I like these people. I don’t know if they’ll ask questions, if they’ll say, “I want to know more.” But it’s a taste, it was a scent of the fragrance of Christ. It was an introduction that somebody else may build on later down the road. Nancy: And I think we should just stress that you don’t have to have a lovely or a large home or fancy meals or fancy stuff to be a welcoming environment for people who have all kinds of needs, to be loved, to be served. Nancy: It can be really informal. It can be simple. Nancy: We just need to get over the picture-book stuff. Nancy: This isn’t Pinterest we’re talking about here. Barbara: Well, I think it’s better if it is informal. I think it is better if you do something simple—just a pot of soup or something very, very simple—because then people are going to relax. If you put on a show, and you get out all your best stuff and make it perfect, people are not going to feel relaxed and comfortable. Barbara: So I think the Pinterest and all that has made it harder rather than easier to invite people in. Nancy: Beauty is beautiful and valuable. Nancy: I love having beautiful things in my home. I love having fresh flowers. I love having an environment that is attractive and beautiful. Barbara: Yes, I do, too. Nancy: You’re an artist, so you really get that. But it’s not about stuff. Nancy: It’s not about whether you got it at a second-hand store or you bought it off some fancy website or department store. That’s all so temporal. Nancy: But what people will remember is the heart, the environment, the love. Nancy: I tell you what, I grew up in a large, lovely home with parents who were able to do some nice meals for people, but I’ve had some of my most precious, meaningful times of fellowship and being loved and welcomed in very, small, simple homes. I’m thinking of some homes in Pakistan where I have visited. . . we’re talking way, way simple. Not impressive. Not elaborate. But people who love Jesus and love His people and love serving. Their home is an embassy. And it may have dirt floors or very simple walls that could blow over in a storm, but it’s an embassy of the King of heaven. Nancy: I want to say this is something anyone who loves Jesus and loves people and wants to be an instrument of Jesus’ love in others’ lives can do in your home. It may be a double-wide trailer. It may be a dorm room. It may be just a room that you share in a home with others. If the presence of Christ is there, that makes it a palace. I want to challenge each of our listeners to think of your home as an embassy of the King and to think of yourself as an ambassador for the King. That’s why I hope each of our listeners will get one of these plaques that you can display somewhere in your home, “Welcome to the embassy of the King.” And just think about what a great conversation starter that is. Nancy: That’s a great gift you and Dennis gave to Robert and me. 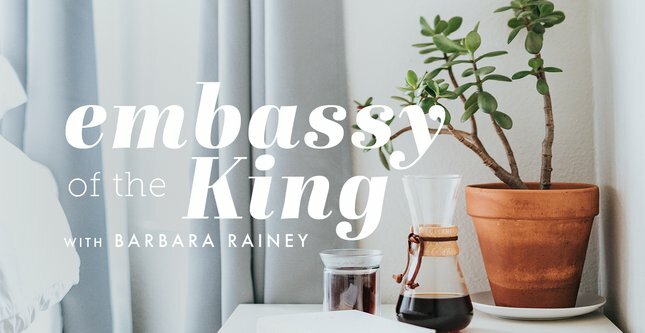 And with that plaque comes a booklet that Barbara has written called, “Your Home, His Embassy.” It will give you other practical ideas, ways to talk with your family about what it means for your home to be an embassy of the King. We’ll send you that plaque and that booklet as a set as our way of saying “thank you” when you make a donation of any amount to help support the ministry of Revive Our Hearts as we’re being His ambassador everywhere this program goes out around the world. Barbara, it’s been so sweet to talk with you over these past couple of days. Nancy: I think a lot more homes are going to become embassies. Nancy: I think a lot more of our listeners are going to think of themselves as ambassadors as a result of hearing what you’ve shared. Nancy: I’d love for you to just close our time in praying that God would do just that in our listeners’ lives. Barbara: I would love to do that. Father, thank You for redeeming us. Thank You for rescuing us and calling us to live in Your home and to be a part of Your country and Your kingdom. But until that is a reality, thank You that You have given us the calling to be Your ambassador today on earth where You have put us, in the house that we live in, the home that we share with others or live in by ourselves, in the community and the city where we live. You have put us there for reasons. You have put us there for purposes and plans. And I pray, Father, that our homes would be a place where we pour generously into the world because You, Father, have poured so generously into us. And I pray, too, Lord, that we would serve others in Your honor so that they can know You, so that they, too, can become citizens of the kingdom of heaven that will last forever. Thank You, Father, that You have called us to be witnesses, and that You have given us the Holy Spirit who will give us power to do that. We cannot do that on our own. So thank You for the gift of the Holy Spirit who will give us power to be witnesses for You, ambassadors for You on this earth until You return. In Jesus’ name, amen. Leslie: That’s Barbara Rainey, praying that each of us will be empowered by the Spirit to live lives that represent and honor Jesus. She’s been talking to Nancy DeMoss Wolgemuth that last couple of days about making our homes a warm and inviting embassy to people in need. If you missed the first half of this series, you can find the audio and transcript of the program at ReviveOurHearts.com. We’ll send you this gift set for your home when you support the ministry of Revive Our Hearts with a gift of any amount. The number to call is 1–800–569–5959. Be sure to request the “Embassy of the King” plaque and booklet when you call, or you can place a donation online at ReviveOurHearts.com. Does God ever act in a way that doesn’t make sense to you? On Monday Nancy will open the book of Job to help you prepare for tragic moments in your family. Please be back next week for Revive Our Hearts. Revive Our Hearts with Nancy DeMoss Wolgemuth is helping you live in a way that represents and honors Jesus. It’s an outreach of Life Action Ministries.